In collaboration with: Medonyx Inc.
Hospital acquired infection is an ongoing concern for the public health care system. Yet much of the infection can be prevented by improving the hand hygiene of caregivers. Due to frequent contact between health care workers and patients, multi-resistant pathogens can be transmitted from one patient to another if good quality hand hygiene is not maintained. Caregivers often fail to comply with handwashing protocols due to inconvenient access to handwashing utilities or shortage of time to perform this procedure. 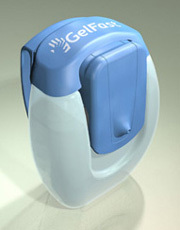 In this context, GelFast, a new handwashing apparatus, was designed to challenge the problem of low handwashing compliance. 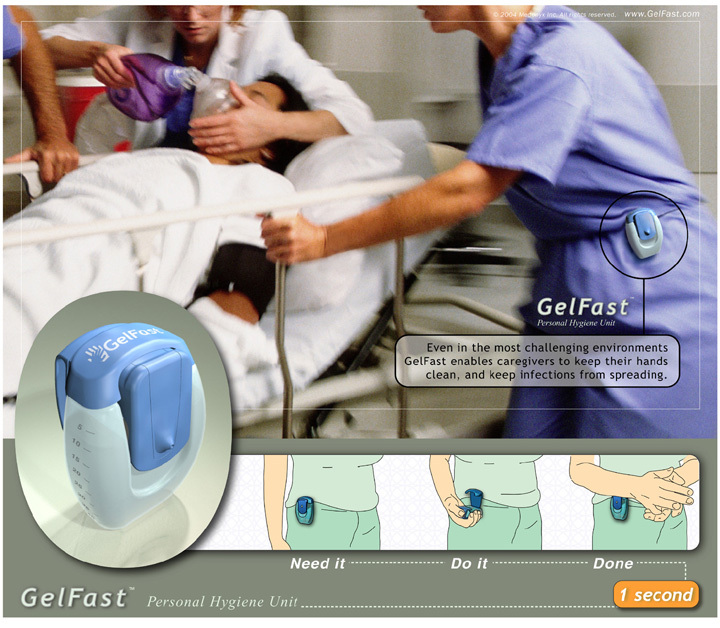 GelFast is a wearable and disposable alcohol gel dispenser designed to eliminate the physical barrier between the caregiver and handwashing by allowing healthcare professionals to wash their hands instantly at anytime and anywhere. The success of persistent handwashing will promote hand hygiene of the caregiver and prevent unnecessary spread of nosocomial infections or outbreaks of transmissible diseases that are commonly seen in the health care setting. 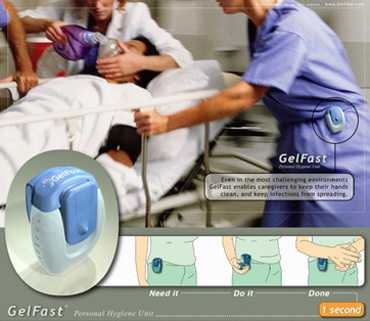 A field trial of GelFast was completed at the Psychiatric Geriatric Complex Continuing Care Unit of the Toronto Rehabilitation Institute in 2004. After this field trial, the University of Toronto has teamed up with the Baycrest Centre for the Geriatric Care to conduct a clinical study testing the usability and the effectiveness of GelFast on hand hygiene frequency among the nurses. Our objective is to determine whether better accessibility of hand hygiene product, such as GelFast will lead to an increase in hand hygiene compliance. For the pilot study at Baycrest, two full time nurses were recruited. The study was an observational based study where an observer is present to examine the handwashing behaviour of the nursing staff. Throughout the study the observer followed the nurses to the patients' room and stood beside the nurse to observe her nursing activity. The entire study lasted for 6 weeks. Weeks 1, 2, 5 and 6 are baseline periods to record the normal handwashing behaviour performed by the nurses without any intervention. Weeks 3 and 4 are the intervention periods where GelFast was introduced as an alternative handwashing device. The observer noted the type of handwashing utilities used, number of observed handwashing opportunities during the entire patient care, the number of times handwashing was actually performed, and whether or not the nurses complied with the hand hygiene Guideline issued by Baycrest. Our results show a significant increase in compliance rate after supplying the nurses with GelFast as the alternative device for hand hygiene practice. Nurses were impressed with the accessibility and practicability of GelFast in providing instant handwashing. Due to undersized sample size and a limited study period, many limitations from the study still need to be resolved. At this preliminary stage of the hand hygiene study, results we obtained cannot be generalized to the general public. Information and data generated from this pilot study could only provide some basis for a future large scale study. At the present moment, a similar study is under progress at Mt. Sinai Hospital. This will be a large scale study that will take into account of inter-observer error, Hawthorne effect and will include more study subjects to diminish distorted data collection. Bischoff, W., Reyonlds, T., Sessler, C., Edmond, M., and Wenzel, R. (2000). Handwashing compliance by health care workers: the impact of introducing an accessible, alcohol-based hand antiseptic. Archives of Internal Medicine, 160, 1017-1021. Boyce, J. (2001). Antiseptic technology: access affordability, and acceptance. Emerging Infectious Disease, 7, 231-233. Hugonnet, S., Perneger, T., and Pittet, D. (2002). Alcohol-based handrub improves compliance with hand hygiene in intensive care unit. Archive of Internal Medicine, 162, 1037-1043. Kampf, G. (2004). The six golden rules to improve compliance in hand hygiene. Journal of Hospital Infection, 56, S3-S5. Larson, E., the Association for Professionals in Infection Control and Epidemiology 1992-1993, and 1994 APIC Guidelines Committee. (1995). APIC guidelines for handwashing and hand antisepsis in health care setting. American Journal of Infectious Control, 23, 251-269. Pittet, D., Hugonnet, S., Harbarth, S., Mourouga, P., Touveneau, S., and Perneger, T. (2000). Effectiveness of a hospital-wide programme to improve compliance with hand hygiene. Lancet, 356, 1307-1312. Zoutman, D., Ford, D., Bryce, E., Gourdeau, M., Gebert, G., Henderson, E., and Paton, S. (2003). The state of infection surveillance and control in Canadian acute care hospital. American Journal of Infection Control, 31, 266-273.